Jacky Faber makes waves, even when docked in her adopted city of Boston to attend to the business of Faber Shipping Worldwide. With big dreams and perhaps too much exuberance for the Puritan populace, she quickly finds herself at odds with the Women's Temperance Union and a town roiling over the arrival of hundreds of Irish laborers, brought in on Jacky's Lorelei Lee. Thwarted at every turn by her enemies, Jacky is forced to acknowledge her shortcomings and possibly lose her beloved Jaimy Fletcher. L. A. Meyer received a master of arts from Boston University, and is currently the curator and exhibitor at the Clair de Loon Gallery in Bar Harbor, Maine. He lives in Corea, Maine. 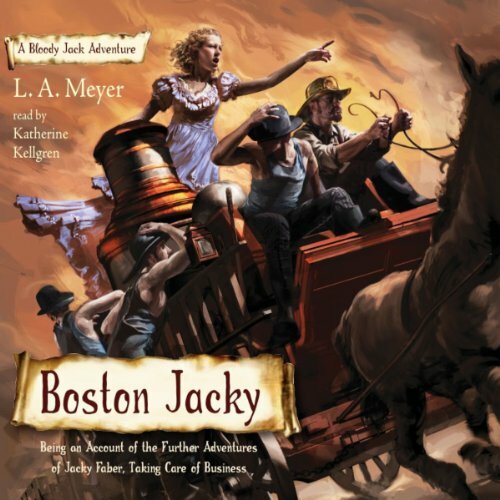 Katherine Kellgren has recorded over 100 audiobooks including the Bloody Jack series, which has been the winner of multiple Audie Awards, Publishers Weekly awards, Odyssey Honor awards, and ForeWord Magazine's Audiobook of the Year awards. She is a graduate of The London Academy of Music and Dramatic Art. Manufacturer: Listen & Live Audio, Inc. Studio: Listen & Live Audio, Inc. Brand: Listen & Live Audio, Inc. If you have any questions about this product by Listen & Live Audio, Inc., contact us by completing and submitting the form below. If you are looking for a specif part number, please include it with your message. By Listen & Live Audio, Inc.